Bespoke glass bending bonding shelving retail displays Decor Glass Leeds. Glass and Glazing. Retail displays, shelving, security glass, fire safety glass, table tops, UPVC shop frontages. Shower screens, shelving, furniture, splash-backs, balustrades, balconies, windows and doors, stained and leaded, etching, and mirrors. Stained glass and leaded glass. Windows, doors, glass balconies and balustrades, security and fire safety glass. 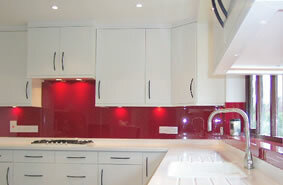 We specialise in UVbonding and glass bending. Let us Glaze your Grand Design!